Tonight is a night of two halves. The first involving a longing stare into the abyss, in the form of the recent split tape between Greek Black/Thrash band Swamp and US death metal entity Fetid Zombie. Swamp are another long running Greek band, having been together since the turn of the millennium. They've released a couple of demos, a comp, a full-length and a couple of splits in that time (this being one. Fetid Zombie is the creation of US illustrator Mark Riddick and has been putting out evil death metal since 2007, with a myriad of release bearing the name including five full-lengths and a split with Nunslaughter. For this tape, FZ has enlisted Proscriptor (Absu) to lend some vocals and has guest solos from Bill Zobolas (Soulskinner) and Toby Knapp (Where Evil Follows). 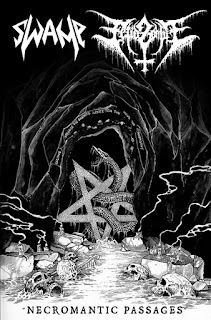 The first three tracks on Necromantic Passages belong to Swamp and their take on putted black/thrash. Lunar Fantasies is exactly what the doctor ordered, containing over five-minutes of cold and hateful black metal that's mixed with groove-laden thrash. The Greek trio sound epic here! The opener feeds out to reveal Swamp’s cover of Tormentor I (originally by Hungarian extreme metallers Tormentor). The melodic lead work during the intro section makes the hairs stand on the back of your neck, before Swamp stamp their own sound on the song. It’s fast and gruesome! The traditional metal touches and awesome solo add to the enjoyment. Inside The Catacomb Of The Undead is the band’s second original song on the split and it does nothing to stop their momentum. They go at it full-force and with their raw-edge, they’ve got a sound that is as infectious as it is gloomy. Fetid Zombie takes over with an Eastern feel, varied instrumentation and gargling death metal vocals during the intro of Nymph Of Tartarus. What follows is windmill inducing drumming, melodic guitars and low-growls. After the pace of Swamp’s offerings, this song may come across as a little slow. That’s no problem though, as what it lacks in speed it makes up for haunting presence. The black metal theme rages through Oracle Of Death thanks to the bleak tones of Proscriptor (Absu), while synths add ghoulishness to the song. The musicianship in the second half is outstanding, with a subtle flourish of jazz here and there. The side-B closer of Laid To Rot contains layers of guitar unlike anything heard so far. The additions of Bill Zobolas (Soulskinner) and Toby Knapp (Where Evil Follows) give it a modern shot in the arm, with some brilliant harmonies and solos. The backbone of death metal is reinvigorated in the song and it’s a great listen from start to end. This split features a lot of variation and is a great example of extreme metal done right.